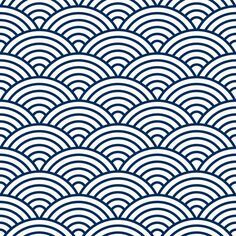 For one of the recent proposals I started roughing out an idea for an installation inspired by this classic Japanese textile pattern of repeating scalloped shapes. The version I started with looks dramatically different than the rest of the work in progress I am sharing here, but it was a rough prototype. I chose five different shades of blue paper to work with and have been playing around with patterns to incorporate into the piece, as well as spacing, and overall assembly. These are four variations as I play around with adding more patterns to the pieces, and whether or not to cut all the shapes or leave them mixed with uncut pieces. I’m really enjoying working with colour in this. I think I’ve cut about eighty individual pieces of paper into a scallop shape with the goal of assembling a sizeable finished piece.